NEW YORK (CNNMoney) -- Hundreds of thousands of postal workers could soon lose their jobs, or face drastic changes to their benefits. According to documents obtained by CNNMoney, the United States Postal Service is appealing to Congress to remove collective bargaining restrictions in order to lay off 120,000 workers. It also wants congressional approval to replace existing government health care and retirement plans. The post office claims it needs to eliminate 220,000 positions, or more than 30% of its staff by 2015, but only 100,000 of those positions can be made through attrition. The other 120,000 must come from lay offs, according to the documents. "To restore the Postal Service to financial viability, it is imperative that we have the ability to reduce our workforce rapidly," the USPS wrote. The USPS is also asking Congress to change legislation that requires postal workers to get federal health care and retirement benefits. Instead, the Postal Service would replace them with its own benefit plans. Currently, postal employees participate in the Federal Employees Health Benefits program, the Civil Service Retirement System and the Federal Employees Retirement System. If given congressional approval, the Post Office would replace those with new plans that would save money, while offering comparable benefits to employees, according to the documents. In the documents, the USPS lays out the harsh reality of the situation: mounting losses, declining mail volume due both to the recession and the shift toward digital alternatives, and the need for drastic measures to cut costs. "The Postal Service is facing dire economic challenges that threaten its very existence and, therefore, threaten the livelihoods of our employees and the businesses and employees in the broader postal industry and overall economy" a document on workforce reduction said. It's no secret the USPS has been struggling, but it's a move that's likely to put Postal Service unions up in arms. USPS mail volume declined 20% in the four year period through fiscal year 2010 resulting in net losses of over $20 billion. In fiscal year 2010, the Postal Service suffered a $8.5 billion net loss, compared $3.8 billion the prior year. Last quarter, the U.S. 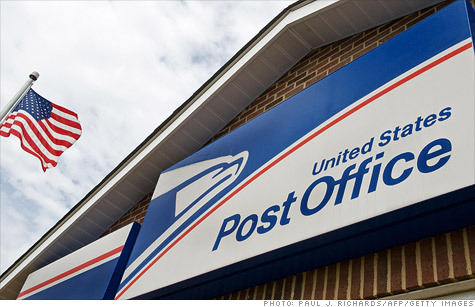 Postal Service posted a loss of $2.2 billion. Its fiscal year ends in September. In July, the Postmaster General Patrick Donahoe released a long-awaited "post office study" of nearly 3,700 potential closings in all 50 states and Washington, D.C. In its appeal to Congress, the USPS warns of an increasingly difficult situation -- one that has the long standing organization "facing the equivalent of Chapter 11 bankruptcy." In the document, the Postal Service warns it will be insolvent next month. "As we continue to review our volume, revenue and financial projections for fiscal years 2012 through 2015, it has become apparent that our financial situation is becoming even more precarious."